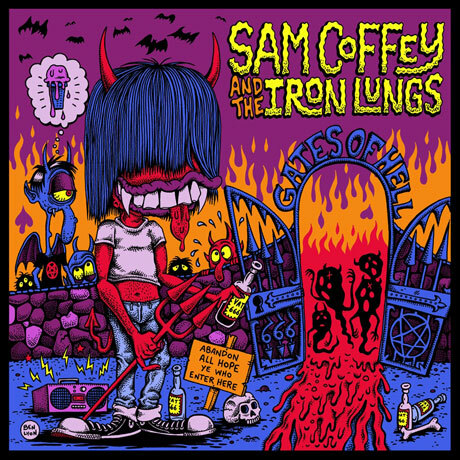 A lineup change and move to Toronto has placed punk- and country-inspired Sam Coffey and the Iron Lungs right at the Gates of Hell, judging by their soon to be released album of the same name. The band's next effort opens up for all to hear June 24 via Southpaw Records. A press release explains that the band's latest set, which follows 2012's Shin No Skin, is the first long-player from the group since they transformed from a quartet into a full-blown sextet. The record was made following a move from Waterloo to Toronto and was tracked in part by Fucked Up/Yung Guv's Ben Cook, with Coffey also handling recording duties. The 10-song set apparently navigates everything from "countryesque ballads, to power-pop anthems, to straightforward punk rippers," with touchstones including the Nerves, the Dentists, the Exploding Hearts and the Romantics. The title track is also said to have Coffey belting the tune out with a "Strummeresque yowl," while first single "Get Pumped Up" oozes out a series of distorted yelps, old-time rock'n'roll licks and rumbling organ tones. You can sample the latter down beneath the tracklisting.